When Anna Thompson (Jessalyn Gilsig) gets mixed up in a convenience store robbery, she makes a split-second decision to walk out of her life and into the unknown. On her travels, she meets Travis (Graham Patrick Martin), a teenage drifter on his own journey of self-discovery. 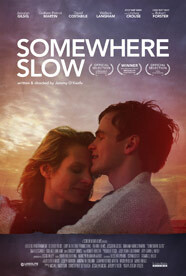 Sparse and provocative, 'Somewhere Slow' shines light on how sometimes we must learn to break our own rules to find the lives we've been yearning to live.